Iced Oatmeal? Taffy Sandwich? Circus Animals? While not necessarily ever having tasting like something a mother has made, Mother's cookies have been around forever, and are beloved by children, adults, the obese, and the obese-at-heart. But in October of 2008, Mother's Cookies went out of business, the result of a stock-punching series of bad business decisions, a corporate bond scandal, and, naturally, these uncertain economic times. Fully bankrupt, Mother's sold their fairly tasty assets for a cool $12 million. 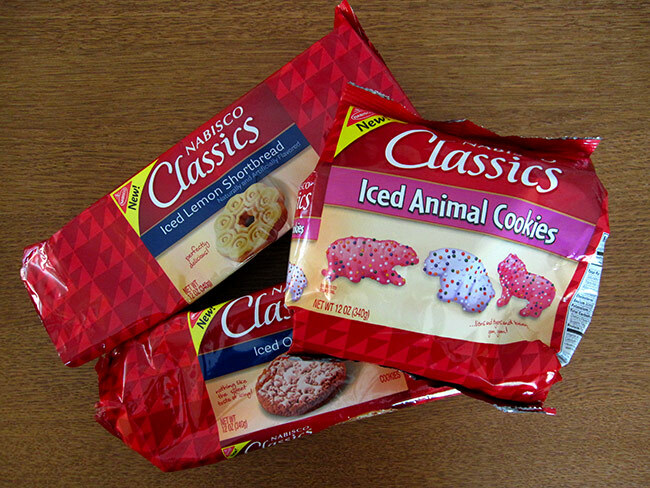 A few months later, much to the delight of fans, the cookies re-appeared in stores, this time as "Nabisco Classics"! There was just one problem: Nabisco didn't buy the rights to Mother's. Kellogg's did. Cookie skullduggery!! Yes, they're failure-ready fakes! I like to imagine that Nabisco had this factory fully built in 1986, with a hardhat-wearing mustachioed staff member ready to push the button and turn out Mother's cookieulcrums at any moment — just waiting, silently, for the company to go chips up. I also like to imagine that Nabisco has a factory ready for every competitor: "Good news, Jenkins! Time to fire up the Pepperidge Plant!" While none of this is probably true, but it's nice to know that even in the cookie world, competition is serious business. I'm a big fan of the Mother's circus animal cookies, and was… upset when they shut down. The crappy Nabisco variety are lemony, and flaky, and overall not very tasty (plus, the pink looks almost fluorescent). I'm certainly looking forward to the Kellogg's reincarnation, since I just found a coupon for them the other day in the paper (yes… some people still buy those), and my stash is finally depleted. To be honest, I actually thought you were about to announce Panic Cookies, having purchased the assets from Mother's. At the risk of full grammar pedantry (or is that nerdery? ), I'd like to point out that the proper plural of "cookieulacrum" is "cookieulacra". As in, "curriculum/curricula". Honestly, the attention to 16th century latin etymological detail of this site has really gone south lately. There's something very wrong about a package of cookies branded "Classics", with a "New!" banner in the corner. yummy, I also like the iced cookies.